Ah, Carvel cake. An essential part of every single birthday party in my family when I was growing up. Children, adults, it didn't matter. We had Carvel. And not because my mom didn't want to bake - she's an excellent baker, and always had fresh cookies in the cookie jar, sticky buns on Christmas morning, and more pies than people at every Thanksgiving and Christmas eve gathering. Baking *is* her thing, yet for birthdays, somehow Carvel always won. Because we demanded it. We did have a Carvel store in our town when I was much younger, so we selected cakes and customized them, and they were fresh. 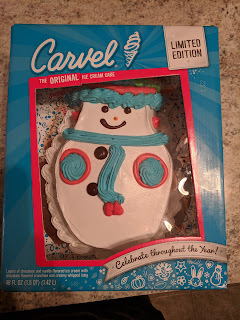 I'm pretty sure Carvel went out of business when I was no more than 10 years old though, so we moved on to the store bought ones, always just made with chocolate and vanilla ice cream, the crunchies, and the same decoration. But it didn't matter. We loved that stuff. "It’s not a celebration without layers of delicious, premium ice cream separated by a layer of chocolate crunchies and covered with whipped frosting and sprinkles." I remember always fighting for the piece with the most frosting, or the most crunchies, which, sadly, were rarely the same piece. The distribution of crunchies (the best part!) was always infuriating - the middle had far, far more crunchies, with edge pieces often barely having any (! ), but ... the frosting was mostly along the exterior. It was always a struggle, did you go for the corner for #allTheFrosting? Or a center piece for crunchies galore? Or, uh, one of each? Anyway, as an adult, when I visited home, my mom sometimes had a slice tucked away for me in a freezer from the last birthday party, and I always eagerly accepted it. Best in a slightly melted form. "Enjoy your next celebration with this 106-oz Carvel Celebration Ice Cream Cake. It is made of layers of chocolate and artificially flavored vanilla ice cream with chocolate-flavored crunchies and creamy whipped icing. The Carvel ice cream cake serves up to 25 people and is ideal for a birthday, holiday or anniversary." Serves 25? Ha. This is *the* cake we get for every family birthday party, where the guest count normally is between 10-18, a few of whom don't eat it. We still get this, for nostalgia sake, from time to time, particularly when I am in town for a birthday. 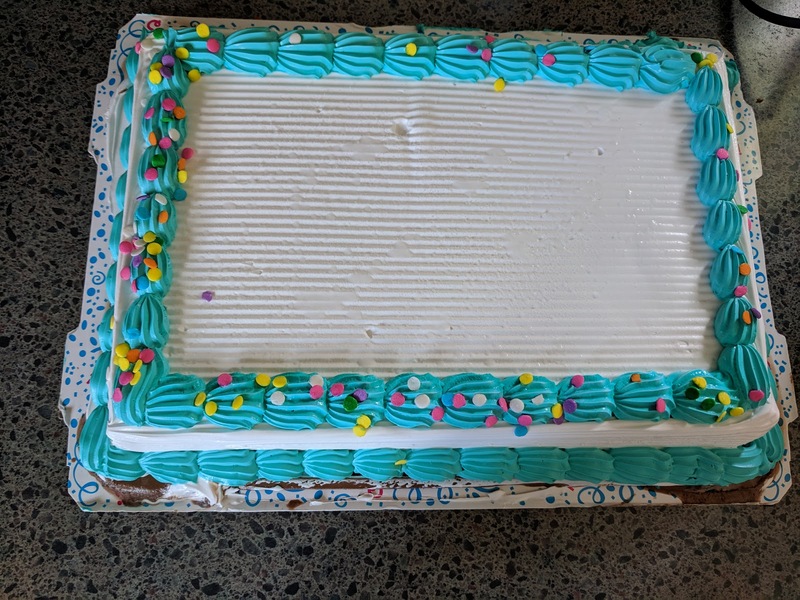 It sadly doesn't live up to my childhood dreams, and the fact that I can't get my ideal piece: lots of crunchy filling, lots of frosting, still infuriates me. My most recent encounter was my own birthday, so I decided to just make the piece I wanted. I took the center piece (most crunch!) and I took a very corner (most frosting!) and I served myself last so I could get all the extra frosting that fell off along the sides. It ... was what it was. The ice cream wasn't great, not particularly creamy nor rich, the chocolate not chocolately, eh. It melted nicely though. The crunchies really didn't live up for me for some reason. Maybe I wasn't in the mood. Maybe I was just too full from the feast my mom prepared. They were fine, but certainly not something I really wanted more of for any reason. This year, I was home for Christmas, and while out shopping for provisions for our Christmas Eve party with my mom, we spotted this. A special edition snowman Carvel cake. Now, my mom was already planning to bake pecan pie, chocolate mixed nut pie, pumpkin pie, and butterscotch pie. She had about 15 kinds of cookies already made. 5 types of fudge. An apple cinnamon pastry. And, well, a huge feast proceeding that. 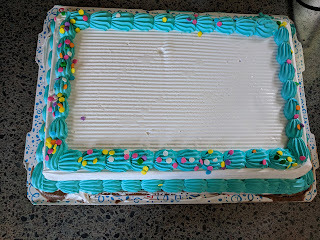 We surely didn't need the Carvel cake. But ... my mom also has, um, a bit of a thing with snowmen. I'd share a photo of her kitchen decorations, but, I'll spare her. Its a bit ... overboard, and now a bit of a family joke, we've issued a "conservation of snowmen" on her, where she can only get a new one if she replaces something. No increase in the number of snowmen. The exception being if one of us re-gifts her a snowman she bought us. Its all in good fun. But it also meant we couldn't pass this opportunity up. There was no choice. 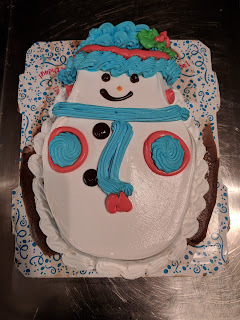 We *had* to add Frosty to the Christmas eve spread. I mean, really, how could you *not* add this guy to the lineup? It was a huge hit, particularly with the kids, and my generation who all remembered our previous Carvel cakes fondly. My cousin and I were first in line, ahead of all the small kids. We were bigger, no contest, and we were getting the best pieces! Frosty ... was good for nostalgia sake, but, I found myself quite critical. I went right for a hat chunk, loaded with tons of blue frosting. I did love that frosting, and the white frosting, so fluffy, soft, and very, very sweet. But the ice cream? Meh. Very generic vanilla and chocolate, not very creamy, certainly better as it melted, but, really, nothing special. But oh those crunchies. Sadly, my hat piece had basically none, so I had to go back for a center piece to get some. And that piece was loaded with crunchies. I adored them as always. Chocolatey, crunchy, and still so addicting. So I liked the crunchies. I liked the frosting (although, wow, so sweet). But the ice cream? Meh. I'll still gladly have a slice of this, but its much lower on my list of "must haves" when I visit home now. Guess I grew up. Another day, another adventure in repurposing leftovers, by reheating them in a waffle iron (read all about it starting here). Well, almost, using the waffle iron. This used my same waffling apparatus (the Cuisinart 5-In-1 Griddler), but with the panini plates, much like I have done with donuts as well. Because, not *everyone* loves waffling things. 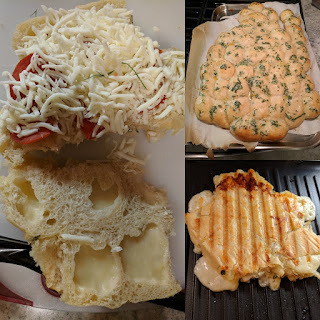 Transformed Leftover Pull Apart Cheesy Bread: Stuffed, and Panini'ed! This adventure also was a bit more involved than most of my creations, where I simply throw leftovers into the waffle iron and transform them. This time we added ingredients and stuffed something. *Way* more work. Normally, I ask, "Will it Waffle? ", but this time, I guess the question is, "Will it Panini?" And the answer, for leftover pull apart cheesy bread rolls, is, YES! 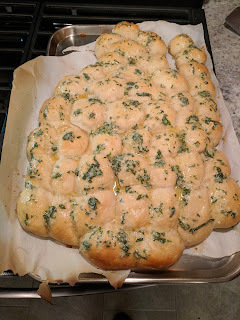 The Original: Christmas Tree Pull Apart Cheesy Bread. 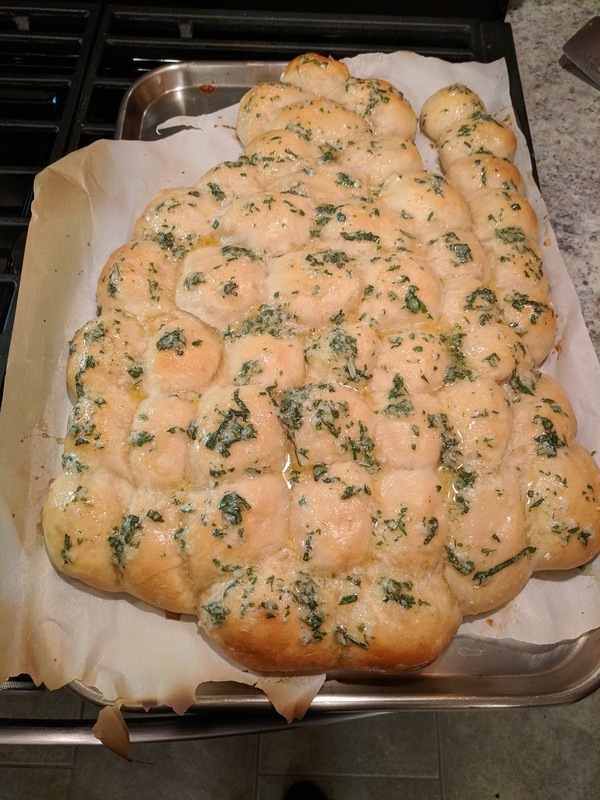 The original was an appetizer my mom served at our Christmas eve party: a, uh, Christmas Tree composed of mozzarella stuffed cheesy pull apart rolls, made from her homemade pizza dough, brushed with butter, Parmesan, and herbs, served with marinara sauce on the side. While the whole Christmas Tree concept might not have necessarily worked out, the dish was a complete success, and a serious crowd pleaser. 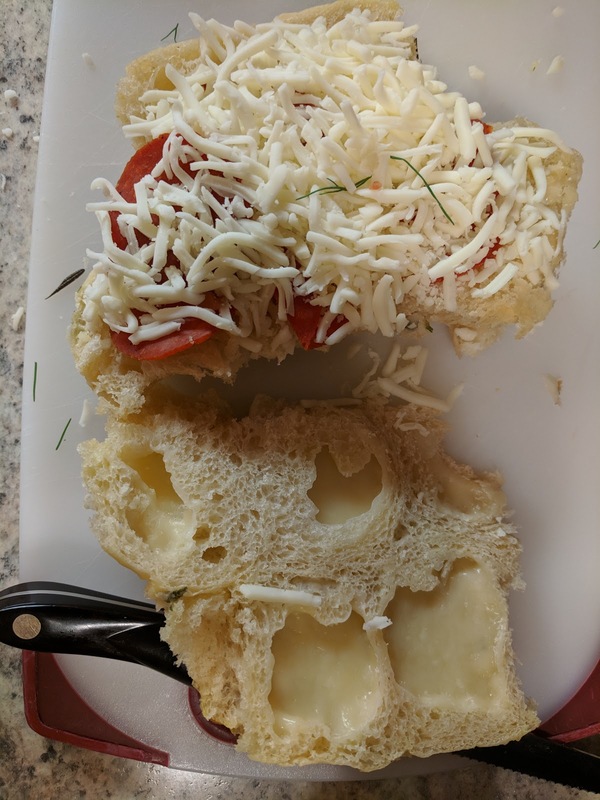 Everyone loved the pull apart rolls, made with her quality pizza dough and filled with gooey cheese. Somehow we had a bunch leftover, which we reheated in a toaster oven one day and served with marinara sauce on the side again, but really wanted a way to make a proper meal, not just an appetizer out of them. So ... we started experimenting, trying to find a way to repurpose them and make them more meal appropriate. "Pizza" and "calzone" somehow feel more correct than just a big pile of rolls with sauce. We took a chunk of them (I think it was 5 rolls?) that were still stuck together, sliced them in half, and stuffed them with pepperoni and more shredded mozzarella. The idea was basically to make a calzone. 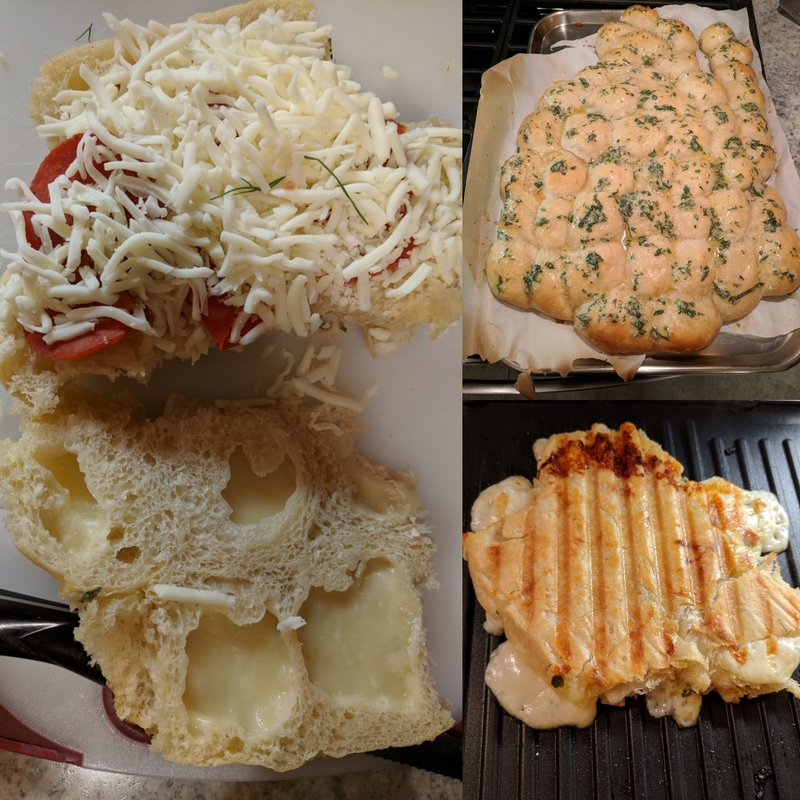 Pull Apart Cheesy Bread, Stuffed, and Panini'ed! 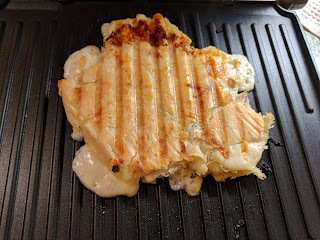 Normally I would have put this into the waffle irons to crisp it up and cook it, but, one member of the family is not into waffling things and finds this to be strange behavior, but is willing to accept paninis. So, we put the panini plates on his behalf. 350 degrees, no coating needed, pressed down hard, and about 4 minutes later, a "calzone" was ready, cheese oozing out, nicely crisp top and bottom. I thought this was pretty awesome, and a great way to repurpose the rolls. 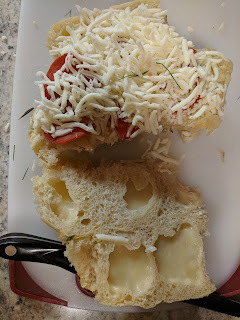 We also made a few individual stuffed ones with other fillings, which also worked great, and allowed us to make them as either entree sized or appetizers. It was a fun family adventure, and I think quite successful, although, the rolls were so glorious in their original form that they were still better that way.